Back then, jigsaw puzzles were much more difficult to solve. One of the reasons is that the pieces were cut exactly between the color lines, so there were no pieces with two colors to show which parts fit where. If that wasn't enough, the adult puzzles didn't even include a picture of the puzzles with them, so one could only guess how their puzzle should look like. When the treadle saw was introduced around 1885, the name jigsaw puzzles was given, although they were actually cut by a fretsaw, not a true jigsaw. 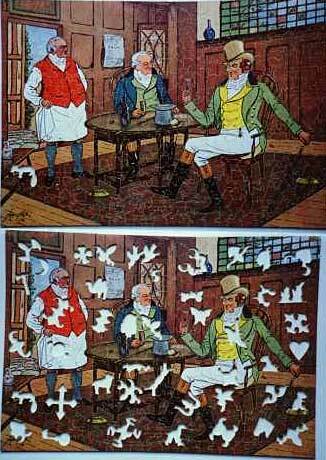 In the early 1900, most jigsaw puzzles were made of wood and cardboard. The puzzles craze began around 1920-1930 when companies like "Chad Valley" and "Victory" in the UK and "Einson Freeman", "Viking" and others in the US started producing a wide range of affordable puzzles.